The easy way to pick up metal debris around the farm. Farms accumulate metal debris in fields, pasture areas, around barns and driveways from pieces falling off trucks and equipment. The metal debris can become hazardous when cattle, horses or other livestock use areas that are littered with debris. 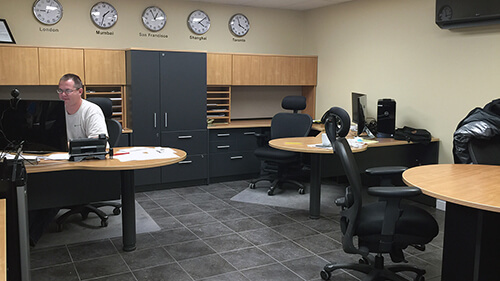 It can also cause flat tires on equipment which can lead to disruptions and downtime and increased costs and delays. Debris on farms is considered light and the need for control low in normal circumstances. But if you’ve experienced a flat or other metal debris problem, the actual potential problem may be larger than you think. Nuts, bolts, nails, hitch pins, wire, screws, screw drivers, wrenches, bits and pieces of equipment, there are so many things that fall off equipment around farms that can cause problems for animals and flat tires on equipment. 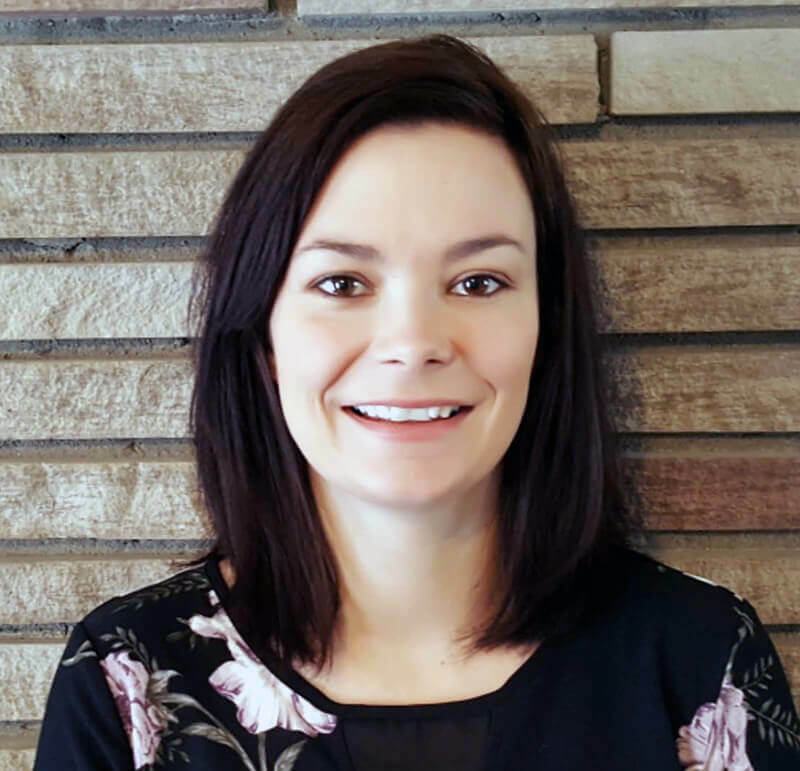 Almost everyone underestimates the extent of their debris problem and the related flat tires or livestock problems that will keep recurring as a result. 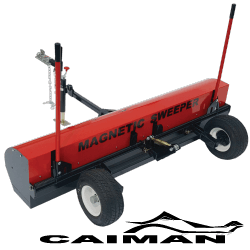 Adding a magnetic sweeper to your equipment can be an easy solution to the problem. What do the staff of Bluestreak have to say on the subject of farm magnets? 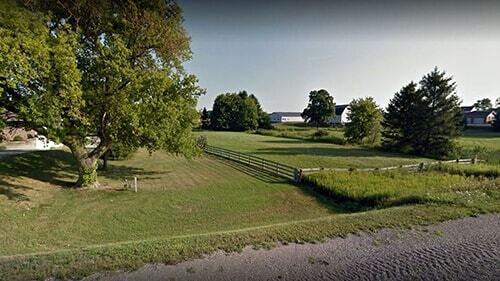 Farms have a lot of dirt, gravel and grass areas that can trap debris. Consider a Debris Digging Rake to turn things over to make it easier for the magnet to pick it up. A Debris Digging Rake also grooms and you can see where you've swept. 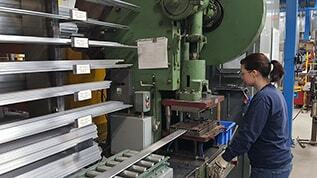 No matter how strong your magnet is, if you go slower or hang the magnet lower, the magnet will perform better. Therefore, when using the magnet set the sweeping height just high enough that it doesn’t hit the ground when using it. 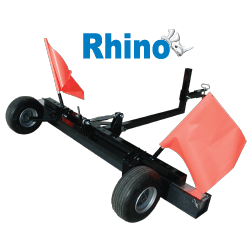 The Rhino magnetic sweeper tows behind ATV’s, tractors, mowers or utility vehicles used around the farm. The Rhino was designed as a severe duty sweeper for off road conditions, in dirt and gravel, and uneven terrain. The Rhino has all the features needed for these conditions including easily adjustable sweeping height, inset wheels to mimimize ground hits, flat proof tires, safety flags for visibility, adjustable hitch height to accommodate many vehicles, and optional Quick Clean Off Sleeve and Debris Digging Rake accessories. 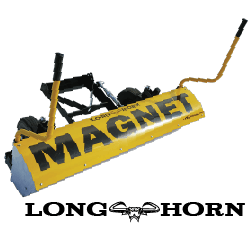 Severe Duty Magnetic Sweeper for Gravel or Dirt Areas. 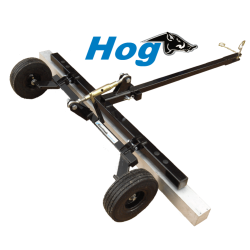 The HOG magnetic sweeper is the little brother of the Rhino. Whereas the Rhino was designed for areas requiring significant pickup power where there is either significant amounts of debris or the debris needs to be pulled up from under dirt, the Hog was designed for the somewhat lighter use applications such as gravel and dirt driveways and yards. 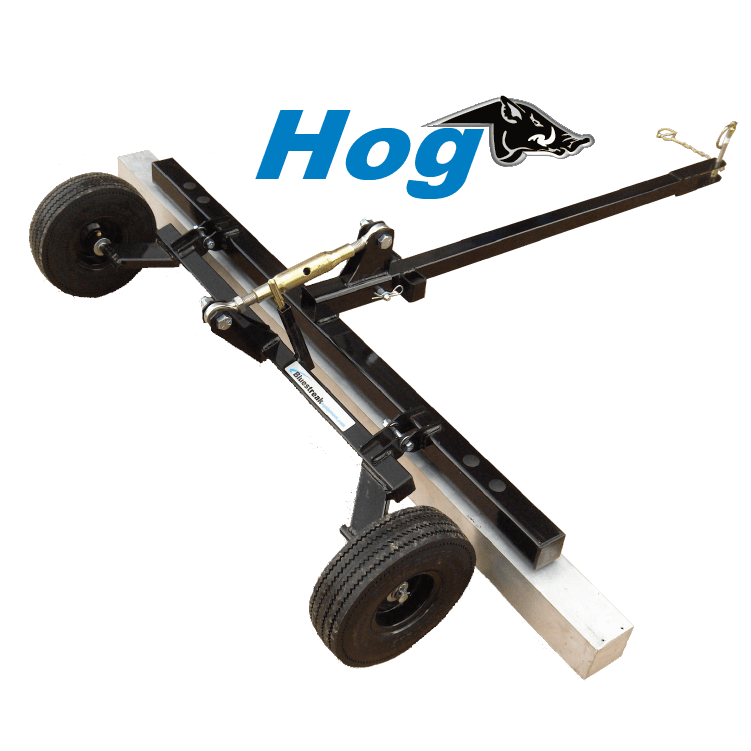 With a 3 × 3 magnetic housing, the Hog maximum lifting height using a two and a half inch nail is 6 inches. The sweeping height is continuously adjustable using the turnable top link. Just turn the top link and the wheels pivot up or down to adjust the sweeping height. The flat proof 10 inch x 3 inch wheels ensure no flat problems no matter how bad the debris problem. Easily towed with an ATV, UTV, lawn mower, golf cart or forklift and clean up metal debris around the farm. The 60 inch width of the HOG is perfect for these tow vehicles because these vehicles are this same general width. 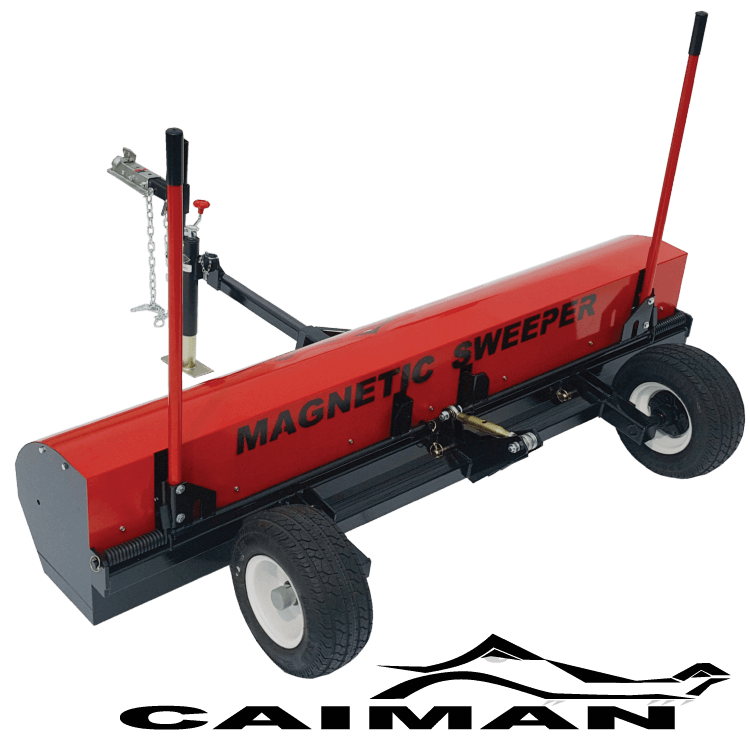 The Yacare magnetic sweeper is a 72 inch wide, durable off road tow behind magnetic sweeper with Spring Assisted Clean Off. The Yacare clean off system is entirely different from both the HOG and RHINO. It replaces the Quick Clean Off Sleeve system with an easier more durable long term solution especially helpful for heavy debris conditions. More power and advanced durability provided by all steel and stainless steel construction and easy effortless clean off with dual debris release levers provide sound rationale to move up from the Rhino to the Yacare. 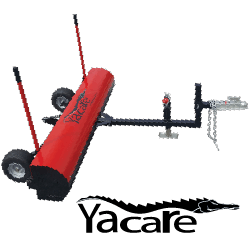 The Yacare’s 72 inch sweeping width, lighter tongue weight and overall slim profile makes it a good choice for towing behind ATV’s, UTV’s, or small tractors around the farm. 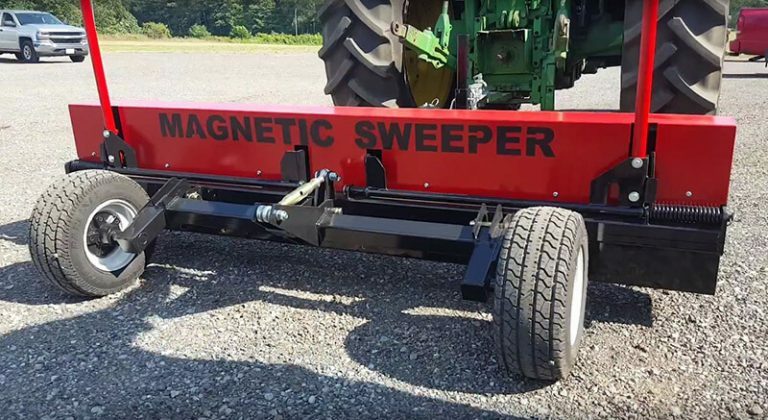 The Caiman magnetic sweeper is one step up from the Yacare magnetic sweeper and is designed to be towed behind larger farm vehicles such as pickup trucks, larger tractors and UTVs. Like the Yacare, the Caiman has enclosed magnets and Dual Spring Assisted Debris Release Handles. However, it’s wider with an 82 inch width. And it has much more power with 50% more magnets than the Yacare. The Caiman also has solid pick up performance in off road conditions found at farm locations. Performance in off road conditions is provided by the “wrap around” design, adjustable sweep height, flat proof tires, adjustable hitch height and optional debris digging rake accessory. 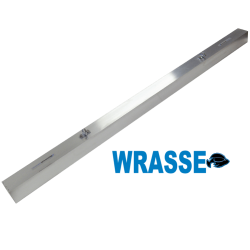 The Wrasse magnetic bar is extremely versatile and can hang from almost any piece of equipment. As long as the magnet doesn’t hit the ground all the time it functions very well allowing the equipment operators to clean environments while they do their normal tasks. Almost every farm these days has an ATV that a hanging magnet can be hung underneath on a more or less permanent basis. As the ATV is used around the farm it will be picking up metal debris continuously. It allows you to clean the farm while you go about your regular chores and routine. 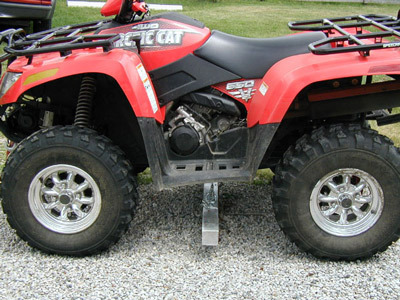 If you don’t have an ATV, the same can be done with a UTV or any other farm vehicle as well. The Longhorn is a great front mount option for farms and agricultural sites that want a simple but highly durable robust magnetic sweeper because they have a lot of clean up to do or have a continuous need over time. The Longhorn allows you to pick up metal debris before you run over it. Leave it permanently mounted or quickly attach and detach when needed. The Longhorn utilizes your ATV winch to be raised or lowered. Maximum Lifting Height 8 1/2" 6" 9 3/4" 10 1/2" 4 3/4" 6" 8 1/2" 7 1/4"
Sweeper Widths 62", 74", 86" 62" 72" 82" 26", 38", 50", 62", 74", 86", 98" 26", 38", 50", 62", 74", 86", 98" 26", 38", 50", 62", 74", 86", 98" 54"